Edgehill and West Pier will meet in the Scarborough FA District Cup final after wins against Whitby Fishermen and Seamer respectively. This comes just a week after these two sides won their Harbour Cup semis to set up a meeting in that final. Pier had to work hard for their victory at Seamer Sports, first-half goals from Sean Exley and Will Jenkinson putting them 2-0 ahead at the break, but only a fine save from Scott Wardman denied the hosts when Danny Price headed powerfully at goal. A fine finish from Jenkinson made sure of the win after the interval, and although the home side pulled a richly-deserved goal back through Danny Glendinning after a goalmouth scramble, Pier restored their three-goal lead when Gaz Thomas headed in from a Martin Cooper cross. Left-back Tommy Barker and central midfielder Jenkinson shared the man of the match award for the victors. Joe Tiffany was named as the star man for Joe Wright's home side, who battled superbly throughout the cup-tie against the league leaders. Edgehill powered to a 7-0 home win against Whitby Fishermen, with Danny Collins smacking in a hat-trick. Collins scored in the 12th and 35th minutes to put Edgehill in control in this semi-final, but it took until the 70th minute for Jackson Jowett to seal their place in the final, the same player making it 4-0 five minutes later. The goal-rush continued less than two minutes later when Collins completed his hat-trick, and Dan Jones notched in the 87th minute and Leigh Watson made it a magnificent seven for Edgehill just 60 seconds later. 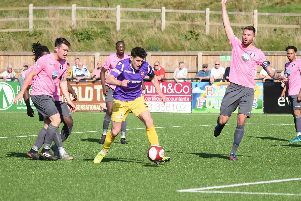 Edgehill boss Steve Clegg said: "It was all one-way really, they only had a couple of free-kicks on the edge of the box all game. "We player some lovely football, all the players did well but man of the match was skipper Joe Gallagher closely followed by James Gunn." Newlands booked their place in the semi-finals of the League Cup with a 2-1 win at Oliver's Mount against Hunmanby United after extra-time. Liam Mancrief put the visitors in front in the 70th minute of a very gritty cup-tie played on a poor playing surface, but Ryan Baldry levelled for United five minutes later and the quarter-final went to extra-time. Mancrief restored Newlands' lead in the first period of extra-time, and he also had a great chance to complete his hat-trick but hit his shot wide then Michael Wilson missed with the goal at his mercy. Newlands chief Geoff Nock said: "It was very difficult to play football as we were playing on the top pitch near the Oliver's Mount monument, the grass was very long and a very uneven surface so both teams tried their best to play football on it. "Our top players were centre-back Jordan Mintoft and central midfielders Matthew Griffiths and Michael Wilson."